Eudaimonia (Greek: εὐδαιμονία [eu̯dai̯moníaː]), sometimes anglicized as eudaemonia or eudemonia /juːdɪˈmoʊniə/, is a Greek word commonly translated as happiness or welfare; however, "human flourishing or prosperity" has been proposed as a more accurate translation. [better source needed] Etymologically, it consists of the words "eu" ("good") and "daimōn" ("spirit"). It is a central concept in Aristotelian ethics and political philosophy, along with the terms "aretē", most often translated as "virtue" or "excellence", and "phronesis", often translated as "practical or ethical wisdom". In Aristotle's works, eudaimonia (based on older Greek tradition) was used as the term for the highest human good, and so it is the aim of practical philosophy, including ethics and political philosophy, to consider (and also experience) what it really is, and how it can be achieved. The Definitions, a dictionary of Greek philosophical terms attributed to Plato himself but believed by modern scholars to have been written by his immediate followers in the Academy, provides the following definition of the word eudaimonia: "The good composed of all goods; an ability which suffices for living well; perfection in respect of virtue; resources sufficient for a living creature." So, as Aristotle points out, saying that eudaimon life is a life which is objectively desirable, and means living well, is not saying very much. Everyone wants to be eudaimon; and everyone agrees that being eudaimon is related to faring well and to an individual's well being. The really difficult question is to specify just what sort of activities enable one to live well. Aristotle presents various popular conceptions of the best life for human beings. The candidates that he mentions are a (1) life of pleasure, (2) a life of political activity and (3) a philosophical life. One important move in Greek philosophy to answer the question of how to achieve eudaimonia is to bring in another important concept in ancient philosophy, "arete" ("virtue"). Aristotle says that the eudaimon life is one of "virtuous activity in accordance with reason" [1097b22–1098a20]. And even Epicurus who argues that the eudaimon life is the life of pleasure maintains that the life of pleasure coincides with the life of virtue. So the ancient ethical theorists tend to agree that virtue is closely bound up with happiness (areté is bound up with eudaimonia). However, they disagree on the way in which this is so. We shall consider the main theories in a moment, but first a warning about the proper translation of areté. As already noted, the Greek word areté is usually translated into English as "virtue". One problem with this is that we are inclined to understand virtue in a moral sense, which is not always what the ancients had in mind. For a Greek, areté pertains to all sorts of qualities we would not regard as relevant to ethics, for example, physical beauty. So it is important to bear in mind that the sense of ‘virtue' operative in ancient ethics is not exclusively moral and includes more than states such as wisdom, courage and compassion. The sense of virtue which areté connotes would include saying something like "speed is a virtue in a horse", or "height is a virtue in a basketball player". Doing anything well requires virtue, and each characteristic activity (such as carpentry, flute playing, etc.) has its own set of virtues. The alternative translation "excellence" (or "a desirable quality") might be helpful in conveying this general meaning of the term. The moral virtues are simply a subset of the general sense in which a human being is capable of functioning well or excellently. Positive Psychology defines Eudaimonia as a self-discovery, perceived development of one's best potentials, a sense of purpose and meaning in life, intense involvement in activities, investment of significant effort, and enjoyment of activities as personally expressive, deep relationships. In terms of its etymology, eudaimonia is an abstract noun derived from eu meaning "well" and daimon (daemon), which refers to a minor deity or a guardian spirit. In his Nicomachean Ethics, (1095a15–22) Aristotle says that eudaimonia means 'doing and living well'. It is significant that synonyms for eudaimonia are living well and doing well. On the standard English translation, this would be to say that ‘happiness is doing well and living well'. The word ‘happiness' does not entirely capture the meaning of the Greek word. One important difference is that happiness often connotes being or tending to be in a certain pleasant state of mind. For example, when we say that someone is "a very happy person", we usually mean that they seem subjectively contented with the way things are going in their life. We mean to imply that they feel good about the way things are going for them. In contrast, eudaimonia is a more encompassing notion than feeling happy since events that do not contribute to one's experience of feeling happy may affect one's eudaimonia. What we know of Socrates' philosophy is almost entirely derived from Plato's writings. Scholars typically divide Plato's works into three periods: the early, middle, and late periods. 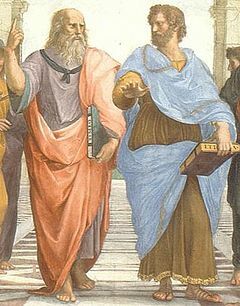 They tend to agree also that Plato's earliest works quite faithfully represent the teachings of Socrates and that Plato's own views, which go beyond those of Socrates, appear for the first time in the middle works such as the Phaedo and the Republic. This division will be employed here in dividing up the positions of Socrates and Plato on eudaimonia. As with all other ancient ethical thinkers, Socrates thought that all human beings wanted eudaimonia more than anything else. (see Plato, Apology 30b, Euthydemus 280d–282d, Meno 87d–89a). However, Socrates adopted a quite radical form of eudaimonism (see above): he seems to have thought that virtue is both necessary and sufficient for eudaimonia. Socrates is convinced that virtues such as self-control, courage, justice, piety, wisdom and related qualities of mind and soul are absolutely crucial if a person is to lead a good and happy (eudaimon) life. Virtues guarantee a happy life eudaimonia. For example, in the Meno, with respect to wisdom, he says: "everything the soul endeavours or endures under the guidance of wisdom ends in happiness" [Meno 88c]. Good Sir, you are an Athenian, a citizen of the greatest city with the greatest reputation for both wisdom and power; are you not ashamed of your eagerness to possess as much wealth, reputation, and honors as possible, while you do not care for nor give thought to wisdom or truth or the best possible state of your soul [29e]. Plato's great work of the middle period, the Republic, is devoted to answering a challenge made by the sophist Thrasymachus, that conventional morality, particularly the 'virtue' of justice, actually prevents the strong man from achieving eudaimonia. Thrasymachus's views are restatements of a position which Plato discusses earlier on in his writings, in the Gorgias, through the mouthpiece of Callicles. The basic argument presented by Thrasymachus and Callicles is that justice (being just) hinders or prevents the achievement of eudaimonia because conventional morality requires that we control ourselves and hence live with un-satiated desires. This idea is vividly illustrated in book 2 of the Republic when Glaucon, taking up Thrasymachus' challenge, recounts a myth of the magical ring of Gyges. According to the myth, Gyges becomes king of Lydia when he stumbles upon a magical ring, which, when he turns it a particular way, makes him invisible, so that he can satisfy any desire he wishes without fear of punishment. When he discovers the power of the ring he kills the king, marries his wife and takes over the throne. The thrust of Glaucon's challenge is that no one would be just if he could escape the retribution he would normally encounter for fulfilling his desires at whim. But if eudaimonia is to be achieved through the satisfaction of desire, whereas being just or acting justly requires suppression of desire, then it is not in the interests of the strong man to act according to the dictates of conventional morality. (This general line of argument reoccurs much later in the philosophy of Nietzsche.) Throughout the rest of the Republic, Plato aims to refute this claim by showing that the virtue of justice is necessary for eudaimonia. The argument of the Republic is lengthy and complex. In brief, Plato argues that virtues are states of the soul, and that the just person is someone whose soul is ordered and harmonious, with all its parts functioning properly to the person's benefit. In contrast, Plato argues that the unjust man's soul, without the virtues, is chaotic and at war with itself, so that even if he were able to satisfy most of his desires, his lack of inner harmony and unity thwart any chance he has of achieving eudaimonia. Plato's ethical theory is eudaimonistic because it maintains that eudaimonia depends on virtue. On Plato's version of the relationship, virtue is depicted as the most crucial and the dominant constituent of eudaimonia. Aristotle's account is articulated in the Nicomachean Ethics and the Eudemian Ethics. In outline, for Aristotle, eudaimonia involves activity, exhibiting virtue (aretē sometimes translated as excellence) in accordance with reason. This conception of eudaimonia derives from Aristotle's essentialist understanding of human nature, the view that reason (logos sometimes translated as rationality) is unique to human beings and that the ideal function or work (ergon) of a human being is the fullest or most perfect exercise of reason. Basically, well being (eudaimonia) is gained by proper development of one's highest and most human capabilities and human beings are "the rational animal". It follows that eudaimonia for a human being is the attainment of excellence (areté) in reason. Aristotle's ethical theory is eudaimonist because it maintains that eudaimonia depends on virtue. However, it is Aristotle's explicit view that virtue is necessary but not sufficient for eudaimonia. While emphasizing the importance of the rational aspect of the psyche, he does not ignore the importance of other ‘goods' such as friends, wealth, and power in a life that is eudaimonic. He doubts the likelihood of being eudaimonic if one lacks certain external goods such as ‘good birth, good children, and beauty'. So, a person who is hideously ugly or has "lost children or good friends through death" (1099b5–6), or who is isolated, is unlikely to be eudaimon. In this way, "dumb luck" (chance) can preempt one's attainment of eudaimonia. Epicurus' ethical theory is hedonistic. (His view proved very influential on the founders and best proponents of utilitarianism, Jeremy Bentham and John Stuart Mill.) Hedonism is the view that pleasure is the only intrinsic good and that pain is the only intrinsic bad. An object, experience or state of affairs is intrinsically valuable if it is good simply because of what it is. Intrinsic value is to be contrasted with instrumental value. An object, experience or state of affairs is instrumentally valuable if it serves as a means to what is intrinsically valuable. To see this, consider the following example. Suppose a person spends their days and nights in an office, working at not entirely pleasant activities for the purpose of receiving money. Someone asks them "why do you want the money? ", and they answer: "So, I can buy an apartment overlooking the ocean, and a red sports car." This answer expresses the point that money is instrumentally valuable because its value lies in what one obtains by means of it – in this case, the money is a means to getting an apartment and a sports car and the value of making this money dependent on the price of these commodities. Epicurus identifies the good life with the life of pleasure. He understands eudaimonia as a more or less continuous experience of pleasure and, also, freedom from pain and distress. But it is important to notice that Epicurus does not advocate that one pursue any and every pleasure. Rather, he recommends a policy whereby pleasures are maximized "in the long run". In other words, Epicurus claims that some pleasures are not worth having because they lead to greater pains, and some pains are worthwhile when they lead to greater pleasures. The best strategy for attaining a maximal amount of pleasure overall is not to seek instant gratification but to work out a sensible long term policy. Ancient Greek ethics is eudaimonist because it links virtue and eudaimonia, where eudaimonia refers to an individual's well being. Epicurus' doctrine can be considered eudaimonist since Epicurus argues that a life of pleasure will coincide with a life of virtue. He believes that we do and ought to seek virtue because virtue brings pleasure. Epicurus' basic doctrine is that a life of virtue is the life which generates the most amount of pleasure, and it is for this reason that we ought to be virtuous. This thesis—the eudaimon life is the pleasurable life—is not a tautology as "eudaimonia is the good life" would be: rather, it is the substantive and controversial claim that a life of pleasure and absence of pain is what eudaimonia consists in. 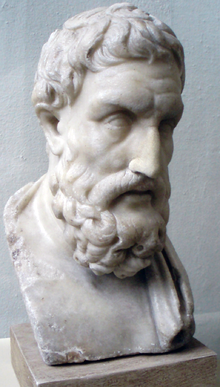 One important difference between Epicurus' eudaimonism and that of Plato and Aristotle is that for the latter virtue is a constituent of eudaimonia, whereas Epicurus makes virtue a means to happiness. To this difference, consider Aristotle's theory. Aristotle maintains that eudaimonia is what everyone wants (and Epicurus would agree). He also thinks that eudaimonia is best achieved by a life of virtuous activity in accordance with reason. The virtuous person takes pleasure in doing the right thing as a result of a proper training of moral and intellectual character (See e.g., Nicomachean Ethics 1099a5). However, Aristotle does not think that virtuous activity is pursued for the sake of pleasure. Pleasure is a byproduct of virtuous action: it does not enter at all into the reasons why virtuous action is virtuous. Aristotle does not think that we literally aim for eudaimonia. Rather, eudaimonia is what we achieve (assuming that we aren't particularly unfortunate in the possession of external goods) when we live according to the requirements of reason. Virtue is the largest constituent in a eudaimon life. By contrast, Epicurus holds that virtue is the means to achieve happiness. His theory is eudaimonist in that he holds that virtue is indispensable to happiness; but virtue is not a constituent of a eudaimon life, and being virtuous is not (external goods aside) identical with being eudaimon. Rather, according to Epicurus, virtue is only instrumentally related to happiness. So whereas Aristotle would not say that one ought to aim for virtue in order to attain pleasure, Epicurus would endorse this claim. Stoic philosophy begins with Zeno of Citium c.300 BC, and was developed by Cleanthes (331–232 BC) and Chrysippus (c.280–c.206 BC) into a formidable systematic unity. Zeno believed happiness was a "good flow of life"; Cleanthes suggested it was "living in agreement with nature", and Chrysippus believed it was "living in accordance with experience of what happens by nature". Stoic ethics is a particularly strong version of eudaimonism. According to the Stoics, virtue is necessary and sufficient for eudaimonia. (This thesis is generally regarded as stemming from the Socrates of Plato's earlier dialogues.) We saw earlier that the conventional Greek concept of arete is not quite the same as that denoted by virtue, which has Christian connotations of charity, patience, and uprightness, since arete includes many non-moral virtues such as physical strength and beauty. However, the Stoic concept of arete is much nearer to the Christian conception of virtue, which refers to the moral virtues. However, unlike Christian understandings of virtue, righteousness or piety, the Stoic conception does not place as great an emphasis on mercy, forgiveness, self-abasement (i.e. the ritual process of declaring complete powerlessness and humility before God), charity and self-sacrificial love, though these behaviors/mentalities are not necessarily spurned by the Stoics (they are spurned by some other philosophers of Antiquity). Rather Stoicism emphasizes states such as justice, honesty, moderation, simplicity, self-discipline, resolve, fortitude, and courage (states which Christianity also encourages). The Stoics make a radical claim that the eudaimon life is the morally virtuous life. Moral virtue is good, and moral vice is bad, and everything else, such as health, honour and riches, are merely "neutral". The Stoics therefore are committed to saying that external goods such as wealth and physical beauty are not really good at all. Moral virtue is both necessary and sufficient for eudaimonia. 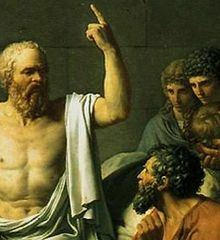 In this, they are akin to Cynic philosophers such as Antisthenes and Diogenes in denying the importance to eudaimonia of external goods and circumstances, such as were recognized by Aristotle, who thought that severe misfortune (such as the death of one's family and friends) could rob even the most virtuous person of eudaimonia. This Stoic doctrine re-emerges later in the history of ethical philosophy in the writings of Immanuel Kant, who argues that the possession of a "good will" is the only unconditional good. One difference is that whereas the Stoics regard external goods as neutral, as neither good nor bad, Kant's position seems to be that external goods are good, but only so far as they are a condition to achieving happiness. Interest in the concept of eudaimonia and ancient ethical theory more generally enjoyed a revival in the twentieth century. G. E. M. Anscombe in her article "Modern Moral Philosophy" (1958) argued that duty-based conceptions of morality are conceptually incoherent for they are based on the idea of a "law without a lawgiver". She claims a system of morality conceived along the lines of the Ten Commandments depends on someone having made these rules. Anscombe recommends a return to the eudaimonistic ethical theories of the ancients, particularly Aristotle, which ground morality in the interests and well being of human moral agents, and can do so without appealing to any such lawgiver. Anscombe's article Modern Moral Philosophy stimulated the development of virtue ethics as an alternative to Utilitarianism, Kantian Ethics, and Social Contract theories. Her primary charge in the article is that, as secular approaches to moral theory, they are without foundation. They use concepts such as "morally ought", "morally obligated", "morally right", and so forth that are legalistic and require a legislator as the source of moral authority. In the past God occupied that role, but systems that dispense with God as part of the theory are lacking the proper foundation for meaningful employment of those concepts. Models of eudaimonia in psychology emerged from early work on self-actualization and the means of its accomplishment by researchers such as Erik Erikson, Gordon Allport, and Abraham Maslow. Central theories are Diener's tripartite model of subjective well-being, Ryff's Six-factor Model of Psychological Well-being, Keyes work on flourishing, and Seligman's contributions to positive psychology and his theories on authentic happiness and P.E.R.M.A. Related concepts are happiness, flourishing, quality of life, contentment, and meaningful life. ^ a b Verena von Pfetten (4 September 2008). "5 Things Happy People Do". Huffington Post. Retrieved 2010-06-05. But researchers now believe that eudaimonic well-being may be more important. Cobbled from the Greek eu ("good") and daimon ("spirit" or "deity"), eudaimonia means striving toward excellence based on one's unique talents and potential—Aristotle considered it to be the noblest goal in life. In his time, the Greeks believed that each child was blessed at birth with a personal daimon embodying the highest possible expression of his or her nature. One way they envisioned the daimon was as a golden figurine that would be revealed by cracking away an outer layer of cheap pottery (the person's baser exterior). The effort to know and realize one's most golden self—"personal growth," in today's vernacular—is now the central concept of eudaimonia, which has also come to include continually taking on new challenges and fulfilling one's sense of purpose in life. ^ Klein, Jacob (2012). Reason, Religion, and Natural Law: From Plato to Spinoza. OUP USA. pp. 63–64. ISBN 9780199767175. LCCN 2012001316. According to Irwin, the Stoic thesis that loss and tragedy do not affect an agent's welfare does not imply that a rational agent has no reason to regret such a loss, for on Irwin's account of Stoic theory the life of virtue and happiness and the life that accords with nature constitute independently rational aims... A number of considerations tell against this interpretation, however. One such consideration is merely an ex silentio appeal. No Stoic source, to my knowledge, suggests that actions may be justified with respect to anything other than what contributes to the end of happiness, and virtue alone does this in the Stoics view. A few texts, moreover, are explicit on this point. Cicero's summary of Stoics' ethics in De finibus 3 considers and rejects the suggestion that Stoic theory is implicitly committed to two final ends, virtue and a life that accords with nature, where these are conceived as independent objectives at which a rational agent might aim... Independent, that is, in the strong sense according to which one of these rational objectives may be realized while the other is not. See Irwin (2007), p. 316: 'Virtuous action. therefore, is not sufficient for achieving the life according to nature, which includes the natural advantages.' Irwin is certainly correct to point out that virtue is not sufficient for attaining the natural advantages, preferred indifferents such as health and wealth. But it is the Stoics' critics, not the Stoics themselves, who maintain that the actual possession of these items is a necessary condition of the life according to nature. ^ Uncertain (19 September 2008). "How "God" functioned in Socrates' life". DD:Religion. Archived from the original on 26 February 2010. Retrieved 2010-06-05. Men of Athens, I am grateful and I am your friend, but I will obey the god rather than you, and as long as I draw breath and am able, I shall not cease to practice philosophy, to exhort you and in my usual way to point out to any of you whom I happen to meet: "Good Sir, you are an Athenian, a citizen of the greatest city with the greatest reputation for both wisdom and power; are you not ashamed of your eagerness to possess as much wealth, reputation and honors as possible, while you do not care for nor give thought to wisdom or truth, or the best possible state of your soul?" ^ a b c Dirk Baltzly (Feb 7, 2008). "Stoicism". Stanford Encyclopedia of Philosophy. Retrieved 2010-06-05. But what is happiness? The Epicureans' answer was deceptively straightforward: the happy life is the one which is most pleasant. (But their account of what the highest pleasure consists in was not at all straightforward.) Zeno's answer was "a good flow of life" (Arius Didymus, 63A) or "living in agreement", and Cleanthes clarified that with the formulation that the end was "living in agreement with nature" (Arius Didymus, 63B). Chrysippus amplified this to (among other formulations) "living in accordance with experience of what happens by nature"; later Stoics inadvisably, in response to Academic attacks, substituted such formulations as "the rational selection of the primary things according to nature". The Stoics' specification of what happiness consists in cannot be adequately understood apart from their views about value and human psychology. ^ Ryff, C. D. (1989). "Happiness is everything, or is it? Explorations on the meaning of psychological well-being". Journal of Personality and Social Psychology. 57 (6): 1069–1081. doi:10.1037/0022-3514.57.6.1069. Wikisource has the text of the 1911 Encyclopædia Britannica article Eudaemonism.